Last fall, I wrote a post about how actual food growing from a tree in my neighborhood was too good to be true and could never happen. Well, guess what? Actual food does grow in my neighborhood on a tree. It happens to be in my neighbor's yard, but that seems like a start. They invited us over to pick mulberries, which are ripening all around us right now. I've never had them before, but Chris assured me that they are edible. 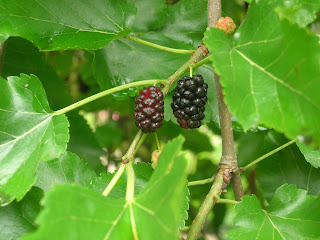 I'm not sure what variety they are -- they look like Morus Nigra, "Black Mulberry." He said they taste just like water at times like this, after it rains, but after the sun has been on them for a while and dries them out, they taste more sweet and berry-like. They are ready to be picked when they fall right into your hand as you pick them. I think a good picking strategy might be to put a clean tarp beneath the tree and shake it. Lots of them were up way too high for us to reach, but plenty grew on the branches that trailed all the way to the ground. They are best when eaten right away -- they don't really keep in the refrigerator. But, they can be used to make jam or jelly, or in a berry "crisp" or pie. 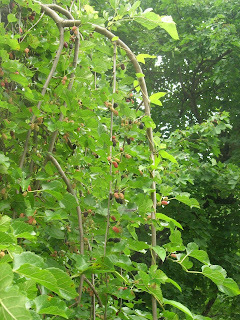 The really good news is, Chris and Pam say that there are some mulberry trees growing in Frick Park. They said continue along the path past Blue Slide Park and they are along the left. I've never noticed them before, but hope to get over there tomorrow to check it out. I've seen these growing around various places, including on the bike trail between Washington's Landing (Herr's Island) and Millvale along the Allegheny River.